I know I said we would see the second shabby lesson card today, but I wanted to show you all something else I have been working on..something new! (We will get to the other shabby card tomorrow) . My workmate Lydell , who is a true artist, is running a class in August called Use your stash, and her ideas and samples are truly amazing and inspired me to grab all the bits and pieces ( die cuts, odds and ends of ribbon,buttons, flowers and papers) that were piled on my desk and turn them into what I am calling Stash Tags. These are made ready to pop on cards and scrapbook layouts and can be stored in one tidy box ready for when I need to make a quick card. Each time I finish creating I will whip up a couple of these to clear up my desk ( that’s the theory anyway!). These ones are actually going to America as a thankyou to a very lovely lady who sent me some beautiful things. I have a few more to make for her and a folder to file them in. I hope this inspires you all to use your stash! Til tomorrow…. It is my mums birthday, and this is the card I have made for her, although to be completely open and honest, once this photo was taken I added a couple more flowers ( in white) in the left hand bottom corner!It is all done with my Go Press and Foil machine,including the foiled embossed background. The butterfly is foiled on acetate, and I foiled the sentiment as well. 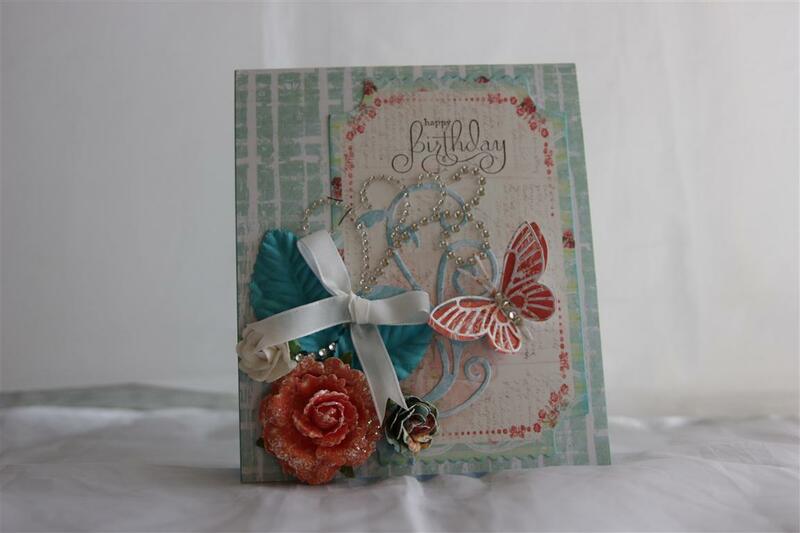 a bit of layering and lace, ribbon and flowers and this one is ready for giving to Mum today. Yesterday was spent ( after a two hour trip to Bunnings to purchase various garden items for Nathan and house paint for me) in the craft room preparing all of June lessons. Glad they are organised because I really have to concentrate on the craft fair in June now. I am looking forward to an enjoyable afternoon at Paper Flourish ( where our on line shop goes live on Tuesday!) with my craft and chat group. til tomorrow….. I have another couple of Go Press and Foil cards to show, so this one today.. I used a kaisercraft embossing folder for the frame ( I have since mastered foiling with my embossing folders so that will be coming soon!) and foiled a todo sentiment stamp made especially for the foiling machine, trimmed it to fit into the frame, and added Green tara flowers,and a foiled chipboard butterfly. the greenery were die cuts on my desk, I have got into the habit when I am diecutting greenery and flourishes to cut a few extra so that I don’t have to stop and dig out dies when I am on a making streak. I have started on my Christmas cards at last, with some lovely new Kaisercraft christmas paper called Christmas Jewel. It has amazing shades of purple and lilac, and silver and I wasn’t going to purchase, but these cards are making themselves,easy paper to work with! til tomorrow…. Here are the other two cards I made for my group Christmas in July challenge..I hadn’t been out to the Craft room annex ( shed) for my Christmas stash so really used what was to hand in the craft room, and I had been making lessons with some Kaisercraft dies, and I always have a bit of glitter paper in the craft room. The stitched oval is a Paper Rose die, and I die cut the bauble on the top card and foiled it through the Go Press and Foil machine as I was experimenting with that new toy at the time. The rest was just assorted bling on my desk. Its a lazy kind of afternoon this afternoon after a busy morning at work, and I am going to have a bit of a sit down with a good book today! Til tomorrow…. A couple of months ago kaisercraft brought out a new range of baby paper called Pitter Patter. 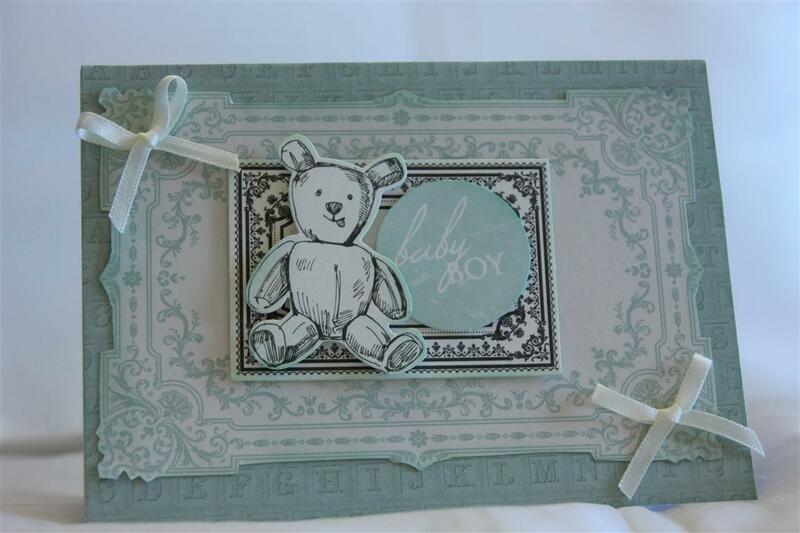 It is gorgeous, and can be used for more than just baby cards, but I started off making a few baby boy cards with with it and this one is the first. I used a piece of patterned paper from the 6″ pad, and some of the matching collectables. I inked all my edges with Stampin up ink – Pool party, and added 2 white ribbon bows. Til tomorrow…..